The results presented in this benchmark are free for scientific, commercial or private use, under the sole restriction of mentioning the source (this page). All images are 24-bit RGB, pages for 8-bit, 16, 32 and 48-bit images may be added later. Notes: Bold value means that no compressor with higher quality is faster. Click on compressed sizes for details. 59 images (1329 Mb) from http://photojournal.jpl.nasa.gov. More details on test data. regular PNG (created by NConvert 5.80), Lossless JPEG (Cornell University), RAR 4.00.
this large 139 Mb image (in PPM format), the file created by Kakadu was taken instead. JasPer and Lossless JPEG were compiled with GCC (version and options as in readme.txt in the FLIC package). All programs were tested on an Intel Core i7-930 CPU, 2.8 GHz, 3 Gb RAM, Windows XP. compiled page Top 10 entries - more details. 13 Apr 2011 - added two programs that were competing in 1999 and 2000: RKIM 1.06 and UHIC 2.0. UHIC dealt with images in BMP format (and short 8.3 names), while for RKIM they were converted to TGA. UHIC fails to fully unpack olympu09.bmp compressed with command e.
For measuring decompression time, olympu11.uhi was decompressed instead of olympu09.uhi. 14 Apr 2011 - added LSP, OpenJPEG 1.4, RAR -m5 -mcc+, -m3, -m1. 15 Apr 2011 - added Pyramid Workshop (ver. 21.03.2011 compiled by Niels Fr�hling), RAR -m5 -mcc-, RAR -m3 -mcc-. 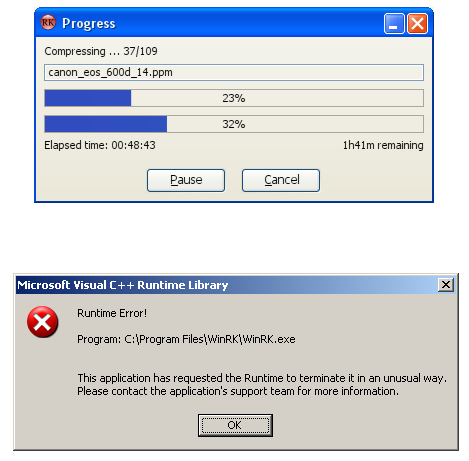 PW with -lv 8 -p 5 -c 65 fails to compress two images, they were compressed with -lv 8 -p 5. With no options it fails to losslessly decompress two other images, but only three bytes differ. 16 Apr 2011 - added FreeArc 0.67 (March 18 2011), PAQ8im decompression time, compiled page Top 10 entries - percentage. 17 Apr 2011 - added Libra8 and ZPAQ 2.05 with bmp_j4 model. and then you run zpaqopt.exe instead of zpaq.exe. Output is bit-exact, but speed is much higher. 18 Apr 2011 - added 7-zip 9.20, BZIP2 1.0.6, HD Photo DPK 1.0.
and finally "System error: Not implemented" if you try 7z a -so archive image >redirect. Bzip2 was compiled with GCC. HD Photo DPK was compiled in Visual Studio 2008 - Release, no project settings were modified. although the format name has changed twice: Windows Media Photo - HD Photo - JPEG XR. 19 Apr 2011 - added APT 1.0 and StuffIt 2010 ver. 14.0.0.18 (Compression Technology version 14.0.0.15). Compression time will be added later. 20 Apr 2011 - added NK2 and compression time for APT and StuffIt. Started testing DLI -q 100 -qc 80 -ac. 21 Apr 2011 - DLI -or is extremely slow. Looks like it will take more than 333 hours to compress all 109 images. 29 Apr 2011 - added WinRK 3.1.2. The only non command line program. Time is "Elapsed time" reported by WinRK itself. five sets are compressed separately. Decompression was bit-exact for all images, both tested profiles. DLI -or -q 100 -qc 80 -ac will finish compressing on Monday or Tuesday. 04 May 2011 - added WinRK with profile HIGH and CharLS v.64769 ( \trunk\charls\test\test.vcproj ). CharLS was compiled in Visual Studio 2008 - Release, no project settings were modified. WinRK with profile HIGH fails to decompress 41st image (canon_eos_600d_14) and all remaining images. and two lossy algorithms: DLI 2.1 and JPEG, both at best possible quality. 13 May 2011 - UHARC 0.6b was tested, C- and D-time will be added later. 16 Jun 2011 - Added UHARC's compression time and decompression time. With -mz it was compressing images in BMP format, because on PPM files compressed size was 39% bigger. are detected as ex-JPEGs (and discarded), but none of the 62 images from photographyblog.com. *Everything except WinRK, DLI in slow mode, Libra8 with options 1 and 2. Return to the main LPCB page.